As far back as 1795, missionaries were growing hemp in California as a high yielding and easily regenerative source of fiber and rope. The state enjoyed well over a century of success cultivating hemp until the United States federal government placed the hemp plant on Schedule I of the Controlled Substances Act in 1970, ignorantly claiming that it poses a high risk for addiction and has no medicinal value. Decades of prohibition ensued, but in 2004, in Hemp Industries Association v. DEA, the 9th Circuit Court ruled unanimously in favor of the hemp plant and against the feds by offering a blanket protection over the sale of “hemp containing foods”. At the time of the ruling, Judge Betty Fletcher wrote of the DEA and the court’s decision, “[T]hey cannot regulate naturally-occurring THC not contained within or derived from marijuana-i.e. non-psychoactive hemp is not included in Schedule I. The DEA has no authority to regulate drugs that are not scheduled, and it has not followed procedures required to schedule a substance. The DEA’s definition of “THC” contravenes the unambiguously expressed intent of Congress in the Controlled Substances Act (CSA) and cannot be upheld”. As hemp found rare bipartisan support in a permanently gridlocked Congress and Senate, hemp laws began to relax at the federal level, and in turn, at the state level as well. California, surprisingly, lagged behind otherwise conservative states like Kentucky on the hemp movement, but popularity of hemp derived products continued to rise, especially with the sudden CBD boom around 2010. This is when we began to see hemp-based products – advertising CBD benefits or not – popping up everywhere from Whole Foods to actual farmer’s markets. But none of the hemp behind it was being grown in California, or even in America, and this remained the case until very recently. As recently as 2014, California allowed limited hemp production for research purposes only with no interest in commercial cultivation. "Industrial hemp" means a crop that is limited to types of the plant Cannabis sativa L. having no more than three-tenths of 1 percent tetrahydrocannabinol (THC) contained in the dried flowering tops, whether growing or not; the seeds of the plant; the resin extracted from any part of the plant; and every compound, manufacture, salt, derivative, mixture, or preparation of the plant, its seeds or resin produced therefrom. In 2016, Cali voters passed Prop 64, and as with most aspects of the “legalizing” of cannabis for recreational use, the new law only added to the confusion surrounding hemp-derived products, particularly those touting CBD as an active ingredient. Though the proposition makes no less than 50 mentions of the term “hemp” in its original language, it also makes it crystal clear that no legal, licensed cannabis dispensary would be allowed to carry hemp-derived products. We are curious if a lab can run a test to determine if a certain low-THC/high-CBD extract was derived from hemp or from cannabis. To combat this, all legal cannabis is supposed to be sourced from legal cannabis farms and distributors, but by 2017, legal dispensaries were just about the only stores in town not selling hemp-derived CBD, so supply was ready to meet demand one way or another. So another year or so slogged on, with legal weed being a series of disappointments for most old school operators, and with hemp just left hanging. . . until the end of last year, that is. 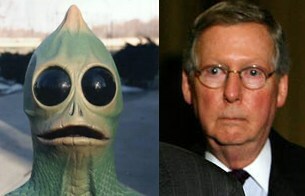 In December of 2018, just before the completely avoidable federal government shutdown began, Republican Senator (and undercover Sleestak, probably) Mitch McConnell famously signed the 2018 Farm Bill with a pen made out of hemp, sending it to President Trump for his final signature that would mark one of the few victories for his Adderall-addled administration. Buried in the bill was groundbreaking language that lifted the decades-long federal prohibition of the hemp plant, removing it from the Controlled Substances Act altogether and opening up possibilities for widespread research, cultivation, manufacturing, and sales of tens of thousands of potential hemp-based products. This alleged green light from the highest levels of our government put dollar signs in the eyes of anxious entrepreneurs who had been waiting for the right moment to launch their pet CBD projects with visions of interstate commerce dancing through their heads. However, before the ink could dry from the president’s scribbly signature, the federal Food and Drug Administration (FDA) released a gutpunch of a statement, acknowledging the new law of the land, but reinforcing their existing stance that “it is unlawful … to introduce food containing added CBD or THC into interstate commerce, or to market CBD or THC products as, or in, dietary supplements, regardless of whether the substances are hemp-derived”. They also warned against making therapeutic or medical claims about any products containing hemp-derived CBD, but in their own warning they issue the dire threat of a possible letter asking you to please stop. Seriously, here’s one they sent the Stanley Brothers, of Charlotte’s Web infamy. This is why you will continue to see vast amounts of hemp-derived CBD products in the most random locations in California and beyond – the Feds just do not have the manpower or the appetite to chase down every single CBD plug. The FDA’s immediate clarification specifically rules on state-to-state commerce, but California is a massive economy in its own right, so advocates for the hemp plant have been demanding clarification of their own from the state level regarding how hemp-derived and hemp-infused products will be treated moving forward. The proposed answer seems to be a newly introduced California State Assembly Bill, AB 228, brought by NorCal Assemblywoman Cecilia Aguiar-Curry. That’s a lot of words, but the keyword in that block is the term “adulterated”. So we went from prohibiting the “manufacture, sale, delivery” of hemp/CBD infused foods and cosmetic goods, to prohibiting “restrictions” on such things. . . now that’s a form of prohibition we can get behind! One point of concern is the lack of language regarding lab testing of hemp-derived products. Really all we see is assurances that these products will not exceed the pre-determined 0.3% THC threshold. We are seeing cannabis being held to an incredibly high standard for testing not only potency, but for pesticides, molds, moisture content, and more, but hemp and it’s outdoor cultivation and naturally high tendency for uptake could find it difficult to meet such scrutiny. The FDA has vowed to reexamine their stance on hemp-derived CBD but they still tout the path that GW Pharmaceuticals took to get its product, Epidiolex, onto the U.S. market. Unfortunately, that prices out the vast majority of people who could truly contribute their craft. Hemp cultivation, manufacture, and sale in California are governed by the California Department of Food and Agriculture (CDFA). Their website, found here, is a useful resource for further research into what is sure to be a massive cash crop in the state’s future. Will 'Track & Trace' Be the Cure for California's Crippled Cannabis Market?